We don't say "Indian" here. I heard it. But I couldn't believe it. Of course I could believe it was said...it was rude Donald. But I couldn't believe there wasn't a quick outcry. In Canada, there is a lot more attention on our First Nations people. Nothing is perfect, there are lots of issues. But there seems to be more general sensitivity and awareness. And there would have been an outcry, a protest, and lots of media coverage. I am very surprised that I barely hear about the First Nations people in the US. They are native to the land! The originals! I have heard Hillary at least talk about them, their situation. But I do not hear their issues talked about. I don't hear about racism towards them. The "Pocahontas" comment, and others that went with them, are not included when the Donald contingent are noticed for their prejudices,like the comments about Afro-Americans, Latinos. 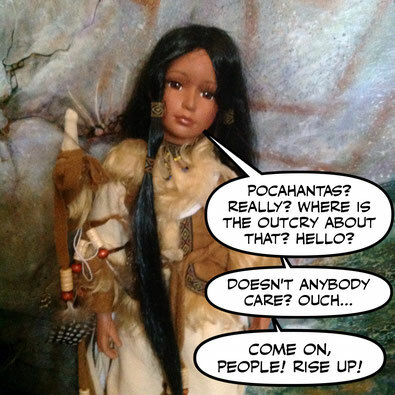 I heard one panel guest flare up at the Pocahontas comment, and little attention was given to her. And considering all the issues that are brought up, hour by hour, by each host, until another issue comes along, I found it surprising. So, a little googling... On CNN itself I found an article by Simon Moya-Smith, a citizen of the Oglala Lakota Nation. "Whether or not Warren is, in fact, Native American is still subject of debate in and out of Indian country, but it is beside the point. We are talking about Native Americans once again being belittled in the mainstream, and this time by a leading presidential candidate. When Trump makes cracks against Warren, he uses the Native American community like a whip -- like an inanimate object, or a people dead and gone, not likely to respond." And listen. Although Simon says "Indian country", it doesn't mean those of us without First Nations ancestry can. If we want to be respectful. and not throw out "political correctness" (which is just civility and consideration taken to a very thoughtful level, and not a BAD THING). I'm sure there are more articles, and responses from Native Americans. But no general media incensed by these comments. I guess there are not a lot of Native Americans hosting or producing at CNN. Just a guess. Everybody counts! Certainly the Native Americans do! I'm surprised there isn't more respect and attention for the real hosts of America in the US. The ones who have been there since time immemorial. Or at least 10,000 years. I'll go look up some history. While I do that would somebody put a stop to this rudeness. It is out of hand.